The Canteen is situated on the market street in Newport, Pembrokeshire. We serve food throughout the day, including our tasty brunch menu, with delicious illy coffee and range of tea pigs teas. 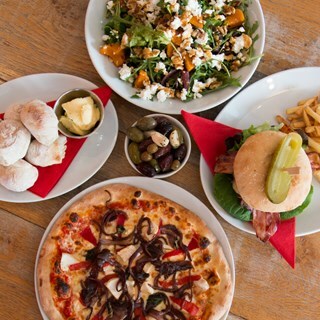 For lunch and dinner, you can choose from our unique selection of stone baked pizza, handmade Welsh burgers and fresh salads.We can cater for special dietary requirements with Gluten free and vegan options available. We also offer takeaway pizza so you can enjoy a slice on the beach or at home. We also stock a full range of wines, local craft beer from Bluestone Brewing and Cider from Gethin’s. We always have a range of tasty desserts and milkshakes available to finish off your meal. Bring your friends or family and enjoy a delicious meal in our unique and relaxing environment. It is our third time at the Canteen and as usual the food and service were up to the usual standard. Keep it up!